Anyone who still indulges in the meme that Nicolas Cage overacts should be silenced by one look at his new film, Joe... that is if they get around to seeing it. Small and unassuming, Joe is an indie by David Gordon Green, a director who's at his best when he makes plot subordinate to the study of one or two well-delineated characters. 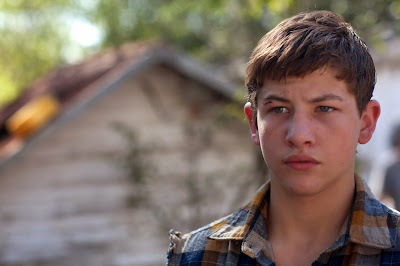 One of those would be Gary (Tye Sheridan), a young drifter with a good work ethic looking to escape the influence of his violent, alcoholic father, Wade (Gary Poulter). Then there's Joe himself, played by Nicolas Cage as an industrious business owner whose stillness belies an explosive temper that has kept him at a remove from all but society's most underprivileged or unjustly ignored. Gary and Joe form a bond when the young man comes around looking for work with Joe's tree removal outfit. He recognizes a kindred spirit even before he witnesses Wade beating Gary, and the boy unleashing his own misdirected anger with the kind of gusto that has translated into setback after setback in Joe's life. Joe wrestles with his own struggles to maintain his composure, particularly against Willie (Ronnie Gene Blevins), a lowlife whose feud with Joe goes back far enough that neither can remember what exactly started it. Wade's growing jealousy over Joe's mentorship of Gary brings him together with Willie after he's been on the receiving end of separate beatdowns at the hands of both Joe and Gary, setting up a fateful confrontation involving all four of them. Just as Werner Herzog did with his recent Bad Lieutenant revision, Green frames Joe in such a way as to harness Cage's volatility to create a raw, beautifully drawn study of both character and locale. Joe sometimes uses his pitbull as a surrogate whenever he feels his own unrestrained anger about to overcome him, usually at a brothel he frequents where the guard dog never fails to greet him with a snarl. Like his own dog, Joe's dead-eyed serenity can give way to vicious brutality on a dime. "Got a lot of scars," Gary says about Joe's dog. Joe's response describes him as much as it does the mutt. "Yeah, but all the others... all the others is dead." It's all part of living in a largely lawless town in dusty, rural Texas where it seems the cops, some of them friendly with Joe, are there to maintain the status quo more than actively keep the peace. Green's penchant for authenticity means that Cage's performance is enhanced by strong truthful performances from Joe's supporting players. Sheridan's growth as an actor continues to surprise with each film, his natural talent reminiscent of the late Brad Renfro's. But the real revelation here is Gary Poulter, a homeless man Green cast as the scraggly Wade who died a short time after production wrapped for Joe. His ability to steal any scene he's in, whether he's just staring off-camera or improvising a breakdance pop-and-lock, brings an unpredictable quality to the muted Joe. The movie's spotlight might be on Nicolas Cage, but it's the late Poulter that's Joe's heart.